Dan Federspill submitted this photo and caption. My name is Dan Federspill (middle) and I was one of the captains at Usurpation Winter Guard (IO). The two gentlemen on either side of me in this photo are Geoff Goelz and Alex Stelken. The three of us were all 2009 age-outs members of the Cavaliers. It was an absolute blast marching with these talented men again! Geoff (left) marched in the Cavaliers in '08 and '09, and Alex (right) marched '06 '07 and '09! I was a rook-out member in '09. 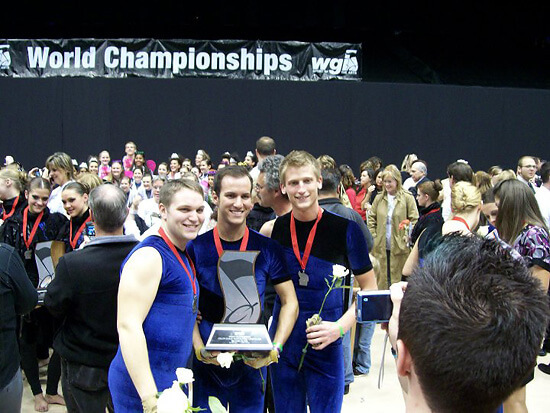 This photo was taken after WGI Open Class retreat while celebrating our second place finish!